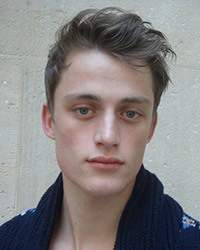 Bastiaan Van Gaalen was born in Netherlands, is an Dutch male model. He was discovered on the streets of Amsterdam, by model scout from modeling agency Republic Men. He began his modeling career in 2010. Essential Homme, CHAOS Magazine Cover, Port Magazine, Zeit, GQ Spain, Apollo, COS, Lui France, Zoo, Esquire Spain, The Greatest, 10 Men Cover, V Man, L'Officiel Hommes Netherlands, Prestage, L'Officiel Hommes Italia, GQ Italia, GQ Australia. Eton of Sweden, Simon, Harrolds Australia, Issey Miyake, Filippa K, Tween, Emporio Armani, Borsalino, Pierre Balmain, Daks, Barfly Scotch & Soda, Shiatzy Chen. Walked runway for Stella Jean, Canali, Moncler, Missoni, Philipp Plein, Ports 1961, Daks, Corneliani, Gucci, Salvatore Ferragamo, Hugo Boss, Louis Vuitton, Moschino, Ermenegildo Zegna, Wooyoungmi, Neil Barrett, Costume National, Pringle of Scotland. Represented by agencies DNA Models New York, Ford Models Europe Paris, Scoop Models Copenhagen FM Agency London. My dreamjob would be making crazy robots/contraptions for movies, commercials or shoots. Shooting with Pierre Debuschere for Numero Homme in a 33 meter deep pool. Amazing team and result.